If we hope to win better conditions of life for our communities, at minimum we must be equally as organized as the political forces that exploit us and work every day to keep our peoples politically marginalized. If we intend to fundamentally change our collective future through liberation struggle, then there should be no doubt that we must be better organized than any force that is brought to bear against us. Protesting alone will not win us substantive social, political, nor economic change. Radical rhetoric alone will not be enough; history and current conditions prove that the only way to bring about real change is through organized liberation struggle. Unión del Barrio was founded on principles that highlighted the essential role of organization within political struggle. Since 1981, we have been critically assessing the strengths and weaknesses of the most advanced people’s organizations here and throughout Nuestra América – the Black Panthers, the Brown Berets, La Raza Unida Party, the Crusade for Justice, the American Indian Movement – the Cuban Revolution, the Mexican student movement of the 1960s, the Chilean Unidad Popular, the Zapatista movement of 1994, and the Bolivarian Revolution in Venezuela, among others. 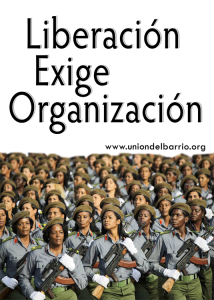 The organized forms of principled unity those organizations and movements have come to represent are what Unión del Barrio intends to reproduce and enrich. We see those movements as having mobilized our only potential source of sustainable power — that is people’s power. 1) Community Level Self-Defense: We need to make Unión del Barrio a party capable of providing for the immediate self-defense of our communities within every sector of our population. Conditions are already truly dire for our gente, and things will inevitably be getting worse. 2) Dual and Contending Power: We live in what is an empire in decline, which is domestically and internationally even more violent and dangerous than an ascending empire. Precisely because of this, we must build a party capable of providing for the economic, political, cultural, and ideological self-determination and self-sufficiency within every sector of our population within the current borders of the U.S.
3) Retaguardia para Nuestra América: We must do the work related to our first two strategic objectives with the understanding that we have an essential role to fulfill as the historical Rearguard (Retaguardia) of the revolutionary process for liberation and socialism that is already taking place throughout Nuestra América. When we struggle locally we must also identify ourselves with and actively defend the socialist revolution of Nuestra América that is currently on the march in the South. When we establish these 3 strategic goals within each of the 11 sectors of community struggle, we will have finally built the “revolutionary party” we have been struggling to build over the last 35 years. We will know we have built a “revolutionary party” not because we publish a declaration or we self-identify as “revolutionaries,” but because it will be self-evident as expressed through our local work defending and advancing the material interests and well-being of our communities, and our ideological work advancing the cause of socialism and creating unity with a continental movement. Only a party such as this will allow us to comprehend and respond to the multiple levels of crisis and repression we are currently suffering under. Only such a party can provide for our self-defense, and only such a party can serve as a vehicle for the articulation and realization of a future determined by our class interests – the interests of a unified and socialist Nuestra América.